The first thing you should know about Mr. Penguin is that he’s not really a penguin. He’s sort of a roach/armadillo hybrid. But the other thing you should know is that late at night, when the moon is hanging over the horizon, he dreams of the ocean. 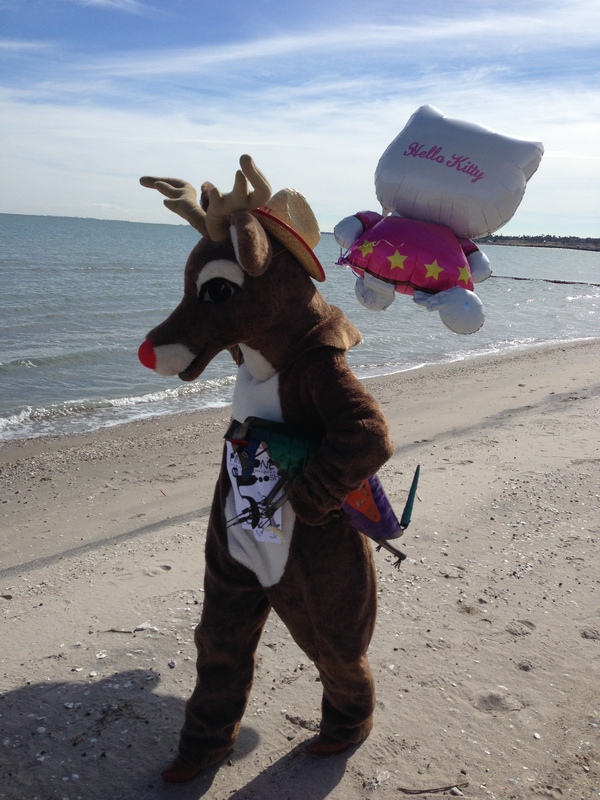 So on the occasion of Thanksgiving, what better gift than a trip to the shore? 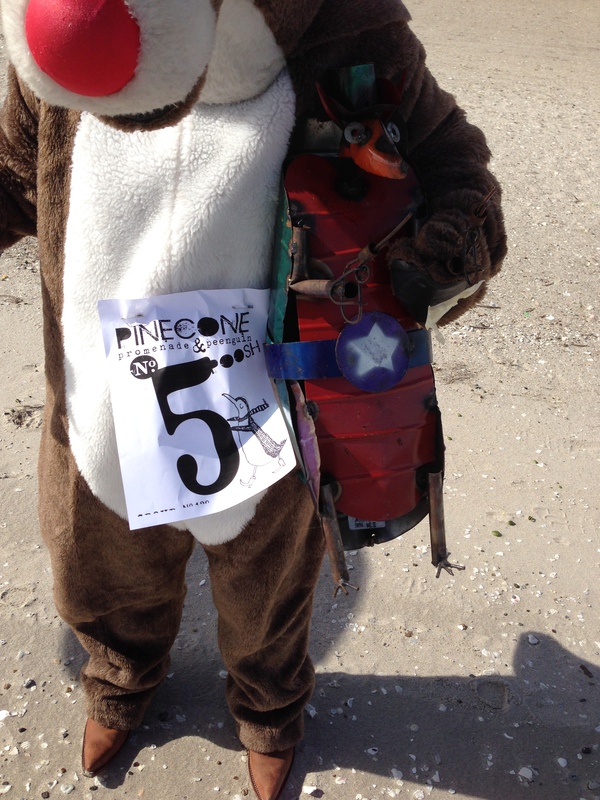 And what better companion than Rudolph? Exactly. They had watched the Macy’s Day Parade in New York that morning. 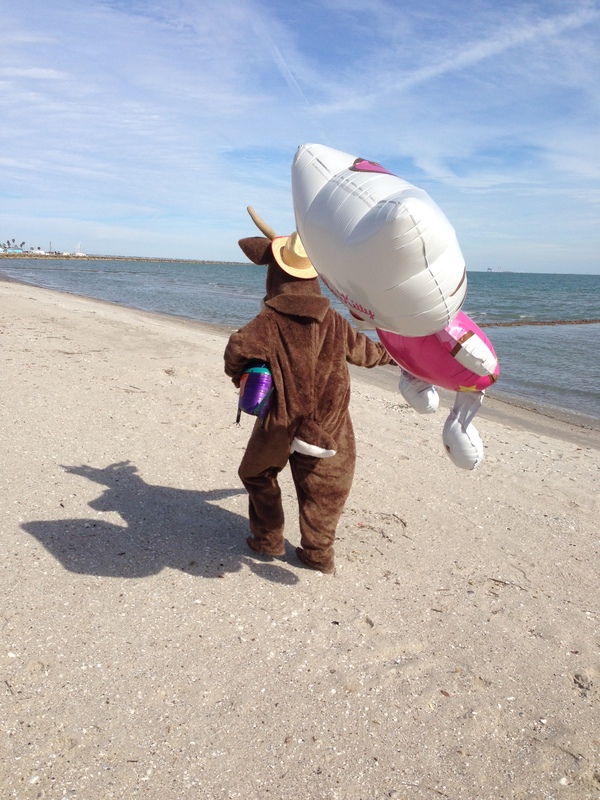 It was sad, because a windy day meant the floats were held close to the ground. They needed a float to fly high, the way floats should. So they called up their pal Hello Kitty. The party was on. It was a warm day at the beach. The sun was out after a long stretch of dreary, rainy skies. Mr. Penguin was happy. 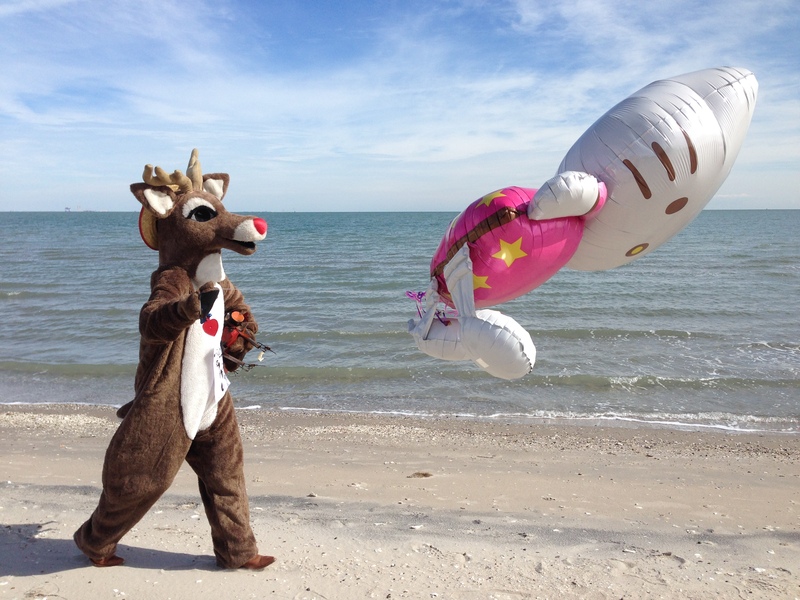 Lots of people were on the beach, but nobody seemed surprised that a reindeer and a penguin and a Hello Kitty balloon were out for a stroll. They just snapped photos and went on their own way. 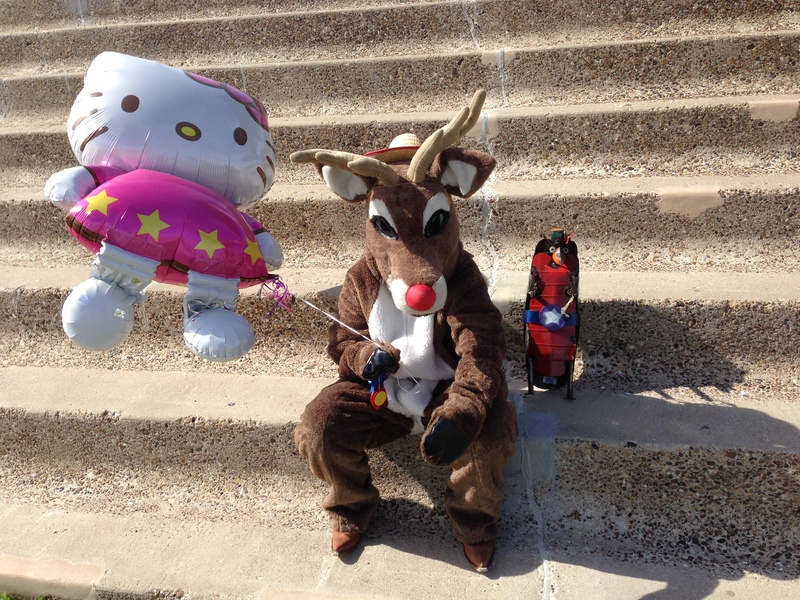 Hello Kitty also went on her own way for a while, forcing the photographer to stage a 100-meter dash that would leave Mr. Bolt in awe. But in the end, it was just the three of them, walking into the sunset. Although it was noon. 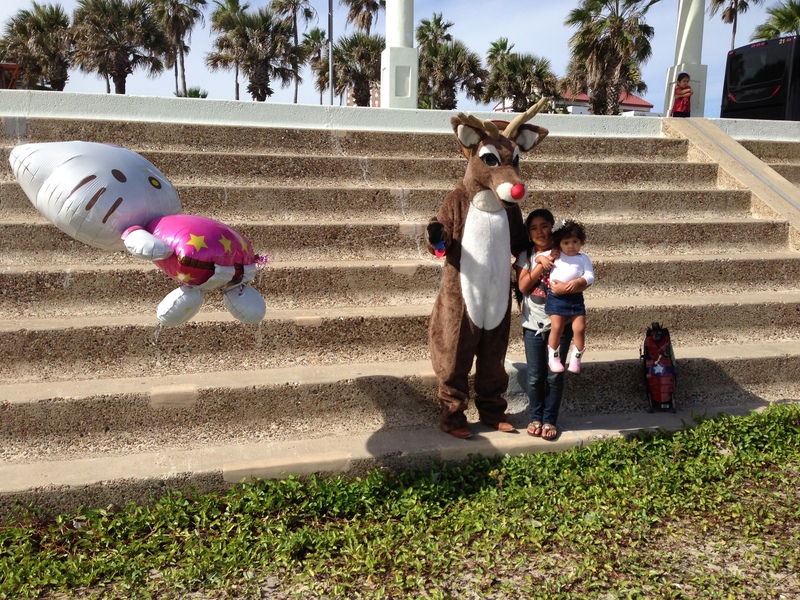 A mom and dad asked if their little girls could pose with Rudolph for a photo. Then Rudolph asked if their little girls could pose with HIM for a photo. It was fun. Except for the middle daughter, who was terrified. If you look closely, you can see her at the upper right. And then, they were done. As parades go, it was a pretty great one. Mr. Penguin got to see water. Hello Kitty got to fly on her own. And Rudolph had a parade. It was a happy Thanksgiving indeed. Haha! Now I see her. Mo is a strange man who scares children. Ha!!! !